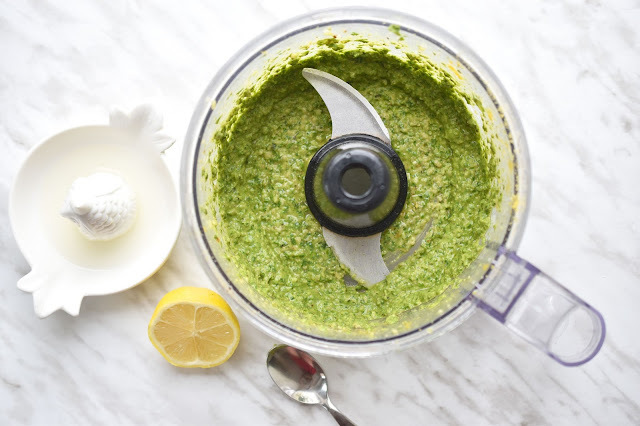 Fresh, homemade pesto is much easier to whip together than you might think. Mix it into cooked pasta and add a handful of sliced cherry or grape tomatoes and you have a delicious, natural pasta salad that's perfect for picnics and beach days. Read on for the recipe and to find out how you should feed your car for summer road trips. I created this Picnic Pesto Pasta Salad recipe in part because of the abundance of fresh basil that should be available on your doorstep or in your garden right now. I say "should be" because of the sad condition of our herb planter, which sits outside our back door, above. Too much rain perhaps? Anyway I had to supplement my stock of basil with store-bought for this recipe, as I didn't want to cut down every little bit of our basil. Let's not even discuss the parsley! 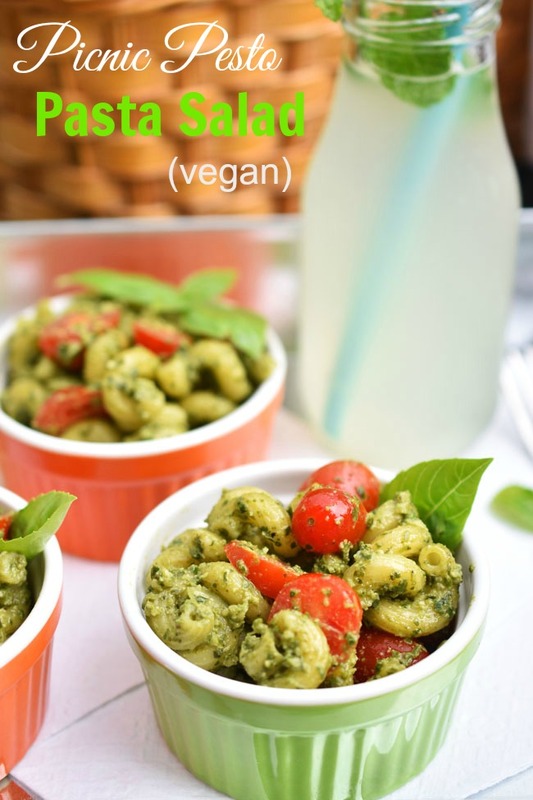 This is an extremely simple-to-make pesto that also happens to be dairy-free and vegan. It requires few ingredients and it's very natural. There is no cheese in this pesto. Rather I used a couple of tablespoons of nutritional yeast. If you're not familiar with it, nutritional yeast is not like a traditional baking yeast - it's not a leavening agent. In the photo above, it's the yellow, powdery/flaky ingredient. It gives a nice cheesy flavour and a lot of vegetarians use it because certain brands are rich with Vitamin B12, which can be hard to get in a vegetarian diet without supplementation. You used to have to head to the health food store to buy nutritional yeast, but it's in many grocery stores now too (mainly in the natural foods aisle or section). 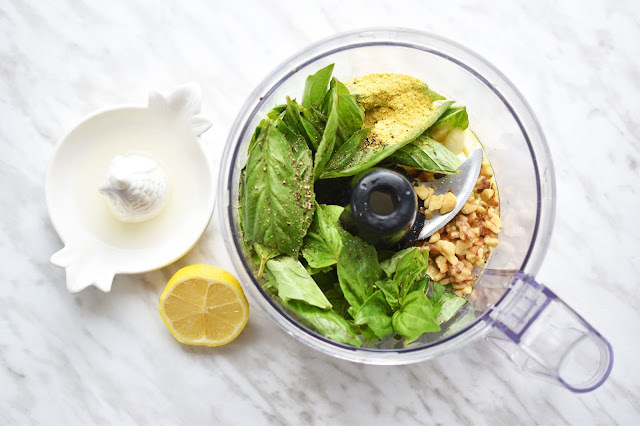 To make the pesto for the pasta salad, simply add basil, nutritional yeast, olive oil, walnuts, garlic, freshly squeezed lemon juice, salt and pepper to your food processor. Process until the mixture is relatively smooth, with flakes of basil still remaining. 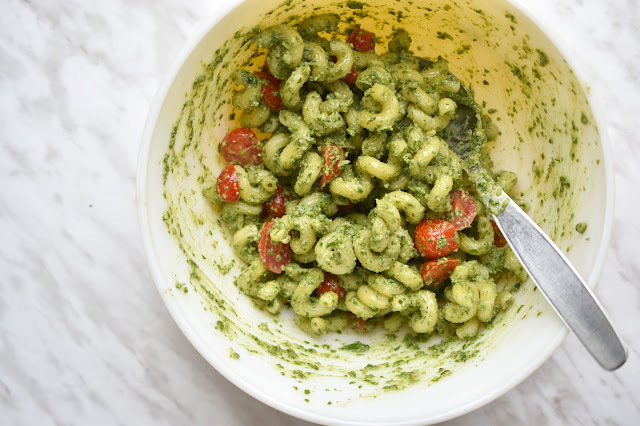 The recipe makes about 1/3 cup of pesto, just enough for our pasta salad. 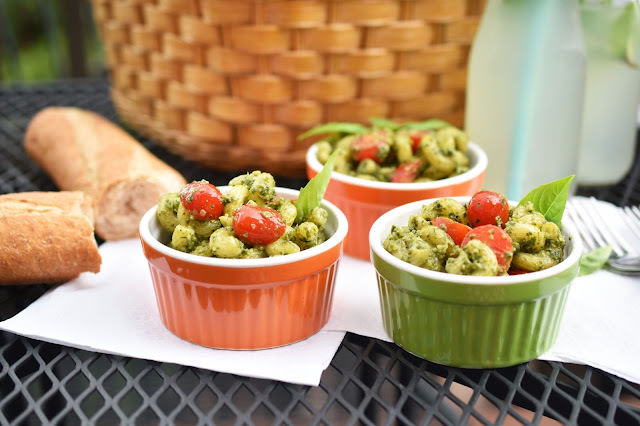 In a large bowl, combine cooked pasta, sliced cherry or grape tomatoes and pesto. Stir until mixed. 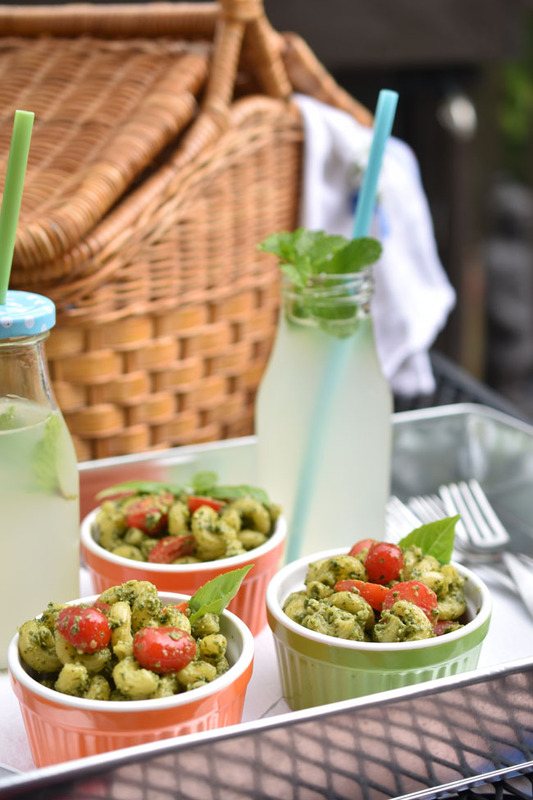 You can eat this Picnic Pesto Pasta Salad slightly warm from the cooked pasta, at room temperature or even cold. 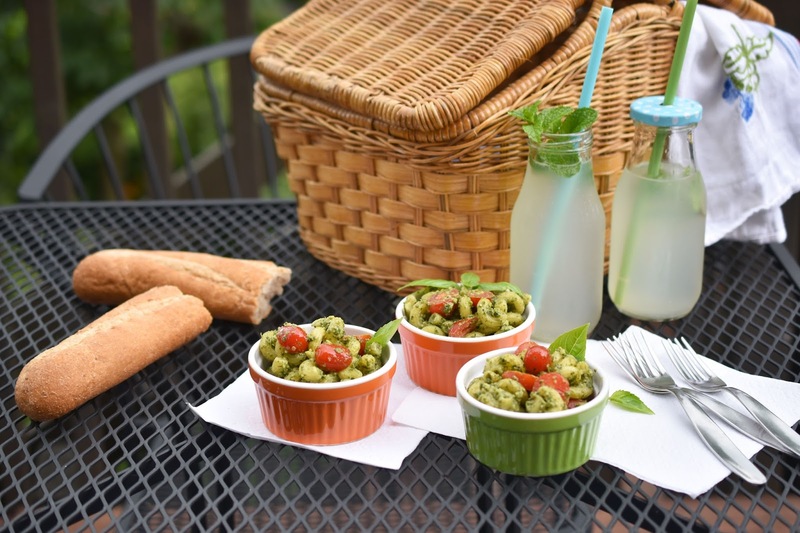 To pack the pesto pasta salad in your picnic basket, dole it out into four individual glass dishes (like these small ramekins) and cover with a lid or plastic wrap. Be sure to pack the salad with ice if you're travelling far. Add a baguette, a fruit salad and bottles of lemonade garnished with fresh mint. Now you've got yourself a quick and tasty picnic! Just as your body doesn't function as smoothly when you eat (and digest) junk food, your car suffers when its motor oil is old and dirty. 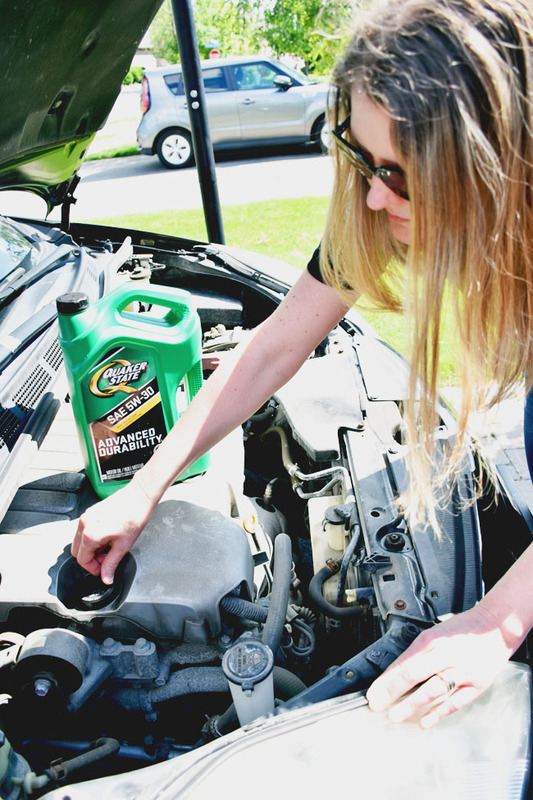 Before you head out for a picnic or summer road trip, consider changing the oil in your car. Follow the car manufacturer's directions in your maintenance manual to determine how frequently you should change the oil. Going too long between oil changes puts your engine at risk, because oil is necessary to reduce friction and lubricate your car's moving parts, as well as keeping dirt from damaging engine parts. 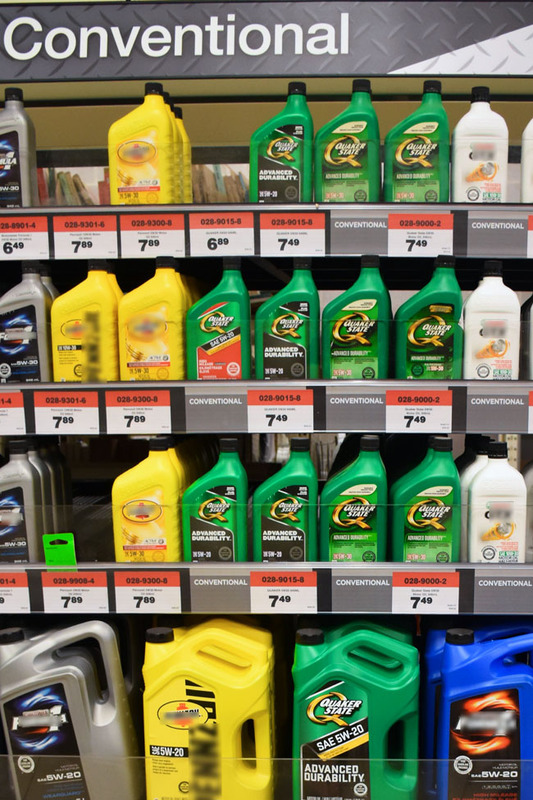 Before heading out on the road this summer, pick up the appropriate product for your vehicle from Quaker State at Canadian Tire. Check the owner's manual or oil cap for the type of oil your car requires. 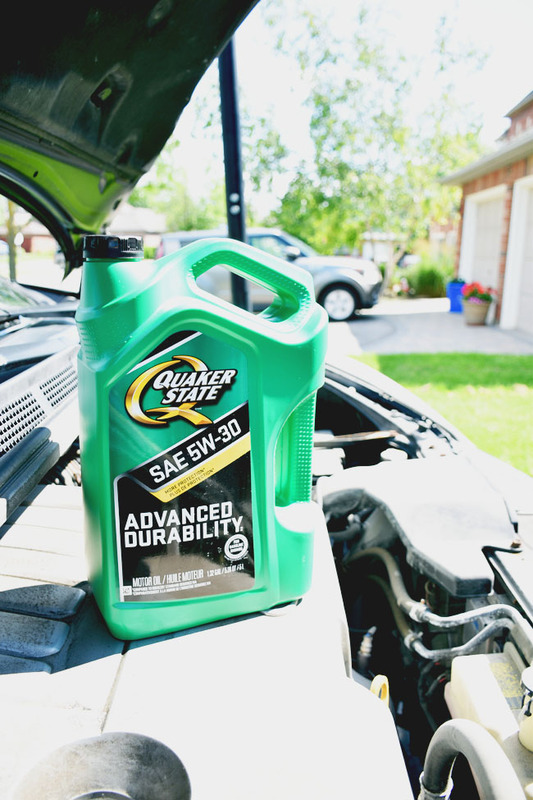 For our van, it was 5W30 and we went with Quaker State® Advanced Durability™ Motor Oil. 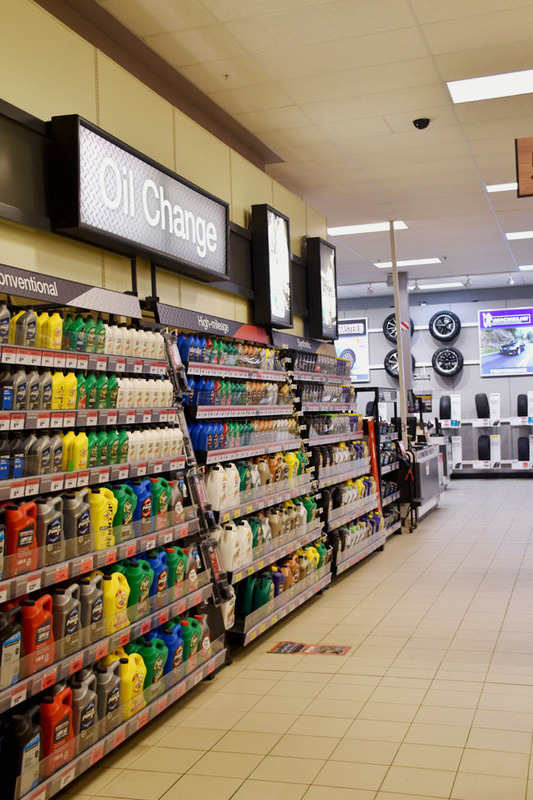 You can find Quaker State oils in the Oil Change aisle at Canadian Tire, right near the Parts & Service department. Quaker State motor oil goes through extensive testing to ensure it can get your car through many thousand kilometres of operation in stop-and-go traffic, while idling, and in extreme weather conditions. They test their oil in taxi fleets across North America, which certainly makes good sense given how often cabbies use their vehicles. In tests, Quaker State® Advanced Durability™ proved it delivers twice the wear protection of the industry standard throughout its life. Quaker State® gives you more durability at a great price, especially at Canadian Tire. If you prefer synthetic motor oil, Quaker State® Ultimate Durability™ Full Synthetic Motor Oil has also been put through the wringer. After hundreds of thousands of kilometres of severe real-world driving it has been shown to perform and even provide more durability with the help of a fuel-saving additive that keeps the oil fresh. You get more engine life via heat-activated elements that kick in when your engine is hot to maintain oil thickness and help extend your engine life. Quaker State Ultimate Durability also provides superior lubrication, flow and pumpability in below-freezing temperatures. Useful for most of us in Canada, right? I think my dad went to Canadian Tire just about every week when I was growing up. Back then, I thought of it as a place for dads. (My dad is 90 and we still buy him Canadian Tire gift cards for birthday and Christmas gifts.) As an adult, I have come to enjoy browsing the aisles of Canadian Tire myself. The Canadian Tire tagline is Made for life in Canada, and for good reason. You can not only find the seasonal items (such as air filters, snow tires, emergency kits) that you need to keep your car ready for fall, winter, spring and summer. You can also find lots of stuff that's meant to help you enjoy all that Canada has to offer, no matter the season. On my last visit to Canadian Tire, I saw an abundance of life jackets and the kayaks to go with them. Plus, beautiful patio furniture and patio accessories, above-ground pools, tents and air mattresses. I bought a bunch of natural cleaning products while I was there. Because life is about cleaning your house too. Maybe not as fun as kayaking, but necessary. Once your car is ready and your picnic basket is packed with goodies, I hope you'll get many chances to head out and have fun this summer. What's at the top of your road trip list? Add all ingredients to a food processor and process until combined and somewhat smooth, but still with visible bits of basil. Makes about 1/3 cup of pesto, just enough for the pesto pasta salad. Add cooked pasta to a large bowl. Stir in cherry tomatoes and then the pesto. Serve immediately (whether warm from recently cooked pasta or at room temperature) or pack up for a picnic! Store leftovers in the fridge for up to 3 days. Wow! This pesto looks delicious! 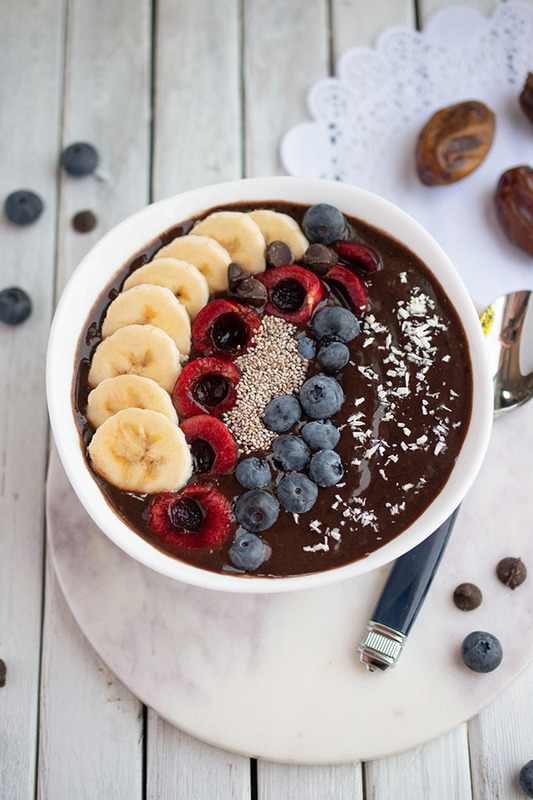 Love how you served it in those pretty bowls. Thanks so much for such a great recipe. This recipe looks delicious. My basil grew quite big over the summer although it's starting to fade now. Time to harvest! That's funny you mention all your trips to Canadian Tire growing up- us too! I remember exactly where it is in our hometown. My parents would usually go there for gardening stuff :) . Thanks for the trip down memory lane. Same here - we need to use up the basil now! I hate to waste it. My dad often went to Canadian Tire alone. I think it was his place to get some peace. Haha. I love it now for the CANVAS line and many other things. The pesto looks phenomenal. I have a ton of basil that came back for a second round...I should probably go out and pick it so that I can make this. I love that it has an absence of cheese and nooch is a great substitute...thanks for the awesome recipe Jo. We enjoy pesto and tomatoes on pasta, but usually have it hot. I never thought of a cold pasta salad this way. It is next on the list. Thank you for the great idea. lol, I love how you incorporate pesto and motor oil into the same post :) I have been looking for a good pasta salad recipe - this one sounds delicious! I have never used nutritional yeast though... interesting! Well i could certainly enjoy this delicious salad you have made the pesto looks creamy delish ! I make a variation of this, but with canned pesto. I really need to start growing some basil. The fresh stuff looks awesome. The salad looks delicious! I must pick the pesto before the nights get cold and make some pesto for the freezer. I love pasta salads, and I love pesto. I didn't realize how easy it is to make. I also have so many cherry tomatoes right now, so this is a must try. Canadian Tire was a place I associate with my Dad as well. I could eat pesto all day, however, I am the only one in my house! As for oil changes, I love that new cars tell you with the indication light. Thanks for sharing this recipe! It will be great for me to take to work! I also think that you could try subbing pinenuts or sunflower seeds instead of the walnuts to make it a nut-free recipe so it's safe to take to schools. 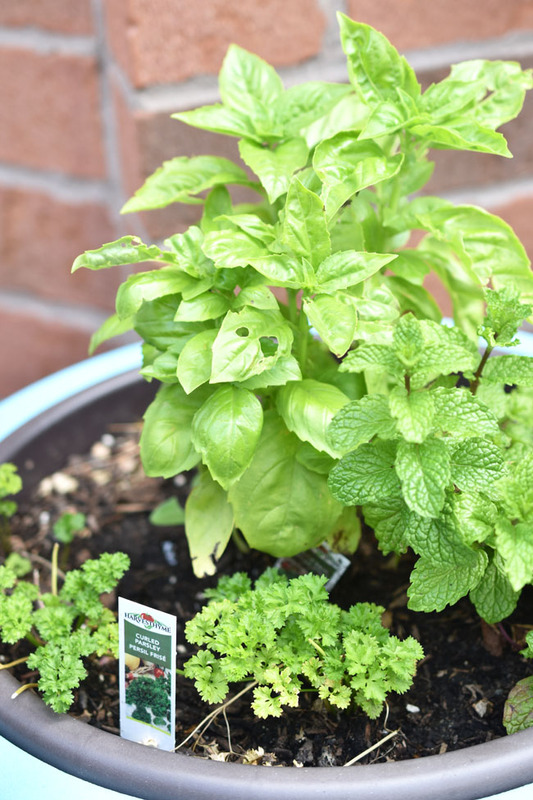 Love that you grow your own herbs, I will try the recipe, but will need to buy the basil. 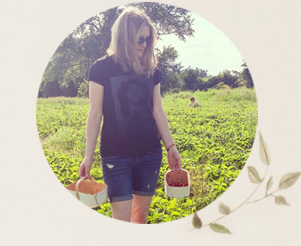 I talk about doing a herb garden every year, maybe next year.